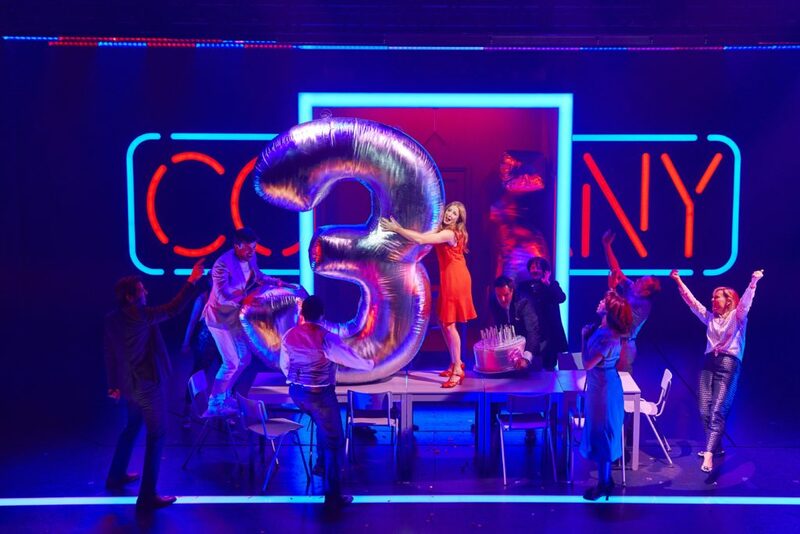 A lot has been made of the gender swapping element of Marianne Elliott’s ground breaking production of Stephen Sondheim’s “Company”. By his own admission, Sondheim was initially unsure that he wanted it to happen. His reservations were understandable: all too often you see theatre where the protagonist has been made female and it doesn’t always work. It is to Elliott’s credit that he was persuaded to allow it (such was Sondheim’s faith in her) and the result is a brilliantly up to date reimagining of the work. It seems that few alterations have been made to George Furth’s book. There are the obvious pronoun substitutions and lyrical changes, yet it is a seamless transformation – it is easy to forget that this version isn’t how it was originally written. Although it is radical, it doesn’t feel it. It feels natural and poignantly relevant, which is the ultimate compliment. Leave any preconceptions and debate at the door and just revel in the astonishing gorgeousness of this production. In the absence of any real plot it relies on the sharp dialogue and characterisation and, of course, Sondheim’s inimitable score. Each song is a vignette – a stand-alone moment, but wedded to the narrative and given a sparkle of confetti by Bunny Christie’s ingenious ‘Alice in Wonderland’ design. Rosalie Craig plays Bobbie, the single, independent woman, as a bewildered onlooker; surveying the inexplicable bargaining, bickering, compromises, trade-offs, understandings and misunderstandings of her friends’ marriages. She perfectly treads the path from amused derision through to a longing to be part of this weird world of wedded ‘bliss’. The dichotomy is heightened coming from the perspective of a woman aware of her biological clock ticking away on her thirty-fifth birthday. There is a spellbinding routine where Liam Steel’s choreography has four identically dressed versions of Bobbie appear to her in a dream as spirits of her future self; stuck in a clockwork loop of morose matrimony and motherhood. Craig gives a performance that will surely make her a West End fixture for quite some time. But she is in good company. It is a show full of star turns. Jonathan Bailey showers the audience with the impossibly quick-fire lyrics of “Getting Married Today” with the lung capacity of a free-diver. George Blagden, Richard Fleeshman and Matthew Seadon-Young, as Bobbie’s three potential boyfriends offer a gloriously fresh take on “You Could Drive a Person Crazy”. Patti Lupone’s “The Ladies Who Lunch” is an unforgettable cry of self-deprecatory discontent. But the beauty of this musical (a real showcase of some of Sondheim’s finest numbers) is that the songs do not eclipse the characters. Mel Giedroyc and Gavin Spokes as the abstemious argumentative couple in denial, Daisy Maywood and Ashley Campbell as the happily divorced couple, Jennifer Saayeng and Richard Henders as the doped-up, straight-laced couple are all hilarious yet touching (my word count is cautioning me to be self-editing here). The entire piece comes with an immense sense of fun, without losing any of the emotive power. Craig’s solos; “Someone Is Waiting”, “Marry Me a Little” and, of course “Being Alive”, are achingly pure and heartfelt. The friends that surround Bobbie repeatedly urge her to find somebody who will take care of her. “But who will I take of?” she responds. I think it’s safe to say that the success of this show is well and truly taken care of. I hope nothing is booked into the Gielgud Theatre for the foreseeable future. Craig’s Bobbie bookends many of the scenes with the simple, singular word ‘Wow’. I left the theatre with the same word resounding in my head. Sondheim’s musical and Elliott’s production is a perfect match. It started with a kiss. A seemingly random kiss but for the characters in this two-hander, it changes everything. Forever. At the outset of the play, Alex (Kenneth Cranham) and Georgie (Anne-Marie Duff) are at a certain point in their lives where they believe they control the way they live. Alex is sitting in St Pancras station like he has so many times before. But this time an American woman comes up and kisses him on the back of the neck. Why? The following ninety minutes explores this with delicious unpredictability, enforcing the notion that we can never really know what will happen next. The show’s title references German physicist Werner Heisenberg’s scientific principle. Without fully understanding the details it seems fashioned around the reasoning that ‘vagueness’ is built into nature. The content of the play is actually much more simple than this suggests. It is primarily a love story – at its heart the outstanding performances of Cranham and Duff as the odd couple. They are poles apart but their shared experiences of loss and need for healing make them inseparable. Initially Duff’s volatile Georgie comes across as the stronger of the two characters, yet the silent strength of Cranham’s Alex quickly subverts the pecking order. His suspicious mind refuses to let the wool be pulled over his eyes and this gives him the upper hand. He simultaneously censures Georgie’s unscrupulous motives while bowing to them – with dignity. He gives her what she wants, but only in so far as it is what he wants as well. They both handle the dialogue expertly. Simon Stephens’ text presents potential clichés but then turns them on their head giving us a whole new way of looking at the unpredictability of relationships – and in particular Georgie’s dubious relationship with truth. The mood can turn on a knife edge and sympathies switch with alarming speed. The emotions grow and shrink within Bunny Christie’s ingenious set of shifting walls. But the strongest moments are the more reflective passages, touching on age, tenderness, loss and loneliness. Kenneth Cranham has a glorious monologue, underscored by Bach’s Sonata for Violin and Piano, where he draws a parallel between the music and life itself. He adores the music, vainly trying to understand a melody whose beauty lies in the fact it takes him completely by surprise: “the secret of the music exists in the spaces between the notes” he concludes. At ninety minutes I was left wanting more. But this, I am sure, is intentional. We are still uncertain. Both Georgie and Alex are accepting this in the final moments of the play. It is when they realise that things are not within their control that they might get a stab at happiness before it is too late. The reference to Heisenberg in the play’s title is, if not misleading, superfluous. This is less about Heisenberg’s uncertainty principle but more about the general principle of uncertainty inherent in nature, and in particular human nature. We all know that “reason and love keep little company nowadays” but it is an absolute delight to be reminded in such an original way with such impeccable performances from two of theatre’s masters.